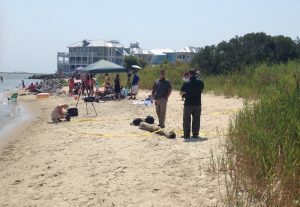 WEST OCEAN CITY — There are more questions than answers this week after a mysterious discovery of a what is now being called a barrel containing possible human remains in shallow water in West Ocean City on Tuesday. Around 9:30 a.m. on Tuesday, a couple from Ellicott City was walking on the beach and in the water off Homer Gudelsky Park, or better known locally as Stinky Beach, a narrow, sandy sliver of beach at the end of Old Bridge Road in West Ocean City, The couple came across a submerged object appearing to be a suitcase or chest. According to the Worcester County Sheriff’s Office, the couple reached into the object, now being identified as a barrel, and pulled out items such as parts of a woman’s shoe, pottery and what appeared to be a bone. The Worcester County Sheriff’s Office deputy who responded to the initial call also believed the object was a bone and called for the Worcester County Bureau of Investigation to respond to the scene. WCBI detectives arrived and concurred the object removed from barrel appeared to be a bone. The Office of the Chief Medical Examiner was called and sent an investigator to the scene and the investigator also concurred. When the barrel was first discovered on Tuesday morning, it was about 20 yards off the shoreline at Stinky Beach and the Maryland State Police and Maryland Natural Resources Police (NRP) dive teams were called to assist in its recovery, largely because it could not be easily removed from the sandy bottom. The allied dive teams members had to come from all over the state to the scene along with their equipment, according to a Worcester County Sheriff’s Office release Wednesday. During their response time, which took at least two hours on Tuesday, the tide changed and the barrel, which was originally submerged in about three to six inches of water, was now submerged in around five feet of water by Tuesday afternoon. The dive teams began a pattern search for the object, but visibility was less than a foot and they had to tediously search the bay’s bottom by hand in an attempt to relocate the object. By now, the sun was setting and heavy vessel traffic from boats returning to the area from the White Marlin Open made the search efforts difficult. At that point, a decision was made on Tuesday evening to discontinue the search effort and resume it on Wednesday during the next low tide cycle. Around 11 a.m. on Wednesday, WCBI detectives along with the allied agency dive teams returned to the scene, waded out into the shallow water and located the object. It was determined at that point the mysterious object that contained a possible human bone was a barrel made of wood and it was deteriorating quickly, according to a Worcester County Sheriff’s Office release. The barrel was fragile to the point pieces would fall off when touched by dive team members. Divers then began to methodically dig around the barrel in an attempt to remove it from the sand, but those attempts were unsuccessful due to the barrel falling apart. A decision was then made to dig out the inside of the barrel in an attempt to identify its contents. However, after the barrel was dug out, the only contents included sand, clams and mussels. Oddly, a scapula, or shoulder blade, of a deer was found in the water near the barrel, according to police reports. At that point, the operations were closed down. However, the suspected bone recovered on the first day of the incident was sent to the Medical Examiner’s Office for possible identification. As of late Wednesday, the Worcester County Sheriff’s Office and WCBI were waiting on the possible identification of the bone recovered from the barrel on Tuesday. The investigation is ongoing.